MainAll NewsMiddle EastInternal Hamas dispute preventing prisoner exchange? Internal Hamas dispute preventing prisoner exchange? Disagreement among Hamas leaders over approach to terror marches reportedly preventing deal involving return of IDF soldiers' bodies. Israel Hayom reported this morning, Tuesday, that a dispute has broken out within the higher echelons of Hamas leadership that is preventing the terror organization from returning to Israel the bodies it is holding. 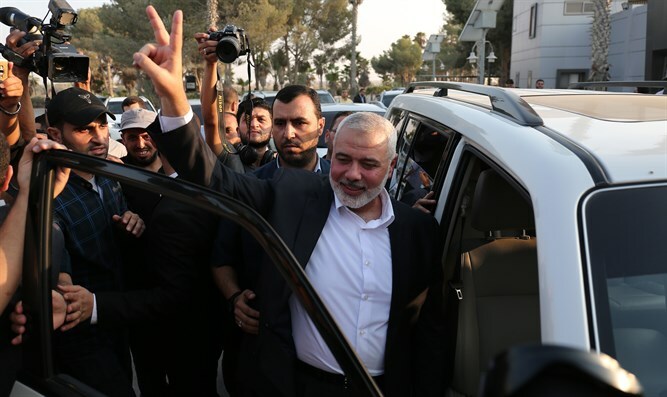 According to the report, Ismail Haniyeh, head of the Hamas political bureau, is at odds with the leader of Hamas in Gaza, Yahya Sinwar, over the terror marches along the Gaza border fence. Haniyeh refused an Egyptian offer to stop the riots, return the bodies of soldiers Oron Shaul and Hadar Goldin, and provide information about the Israeli civilians being held in the Gaza Strip, in exchange for an ease in restrictions on Gaza and the return of Hamas prisoners held in Israel. Among the easing of restrictions offered to Hamas is the opening of the Rafah crossing between Gaza and Egypt, but the confrontation between the Hamas leaders is preventing a unified response to the Egyptian mediators. The information is confirmed by an Egyptian intelligence official, who claimed that Ismail Haniyeh also refused to participate in discussions that were supposed to take place in Cairo about the proposal. A senior Hamas figure in Gaza is quoted in the paper as saying: "Sinwar is furious at Haniyeh's cooperation with Tehran, which harms Palestinian interests."